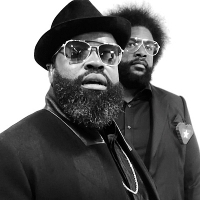 The Roots are a renowned, multi Grammy-winning American hip hop band formed in 1987 by Tariq "Black Thought" Trotter and Ahmir "Questlove" Thompson in Philadelphia, AKA The Legendary Roots Crew, The Fifth Dynasty, The Square Roots and The Foundation. They released their debut album, "Organix " in 1993, followed by: "Do You Want More?!!!??! " (1995), "Illadelph Halflife " (1996), "Things Fall Apart " (1999), "Phrenology " (2002), "The Tipping Point " (2004), "Game Theory " (2006), "Rising Down " (2008), "How I Got Over " (2010), "Undun " (2011), "...And Then You Shoot Your Cousin " (2014) and 2017's: "End Game ".